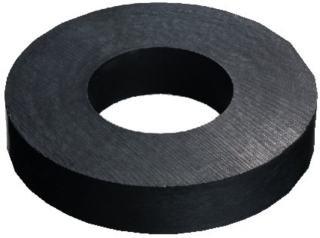 Enlarge Magnetic ring of high-quality ferrite, for the partly compensation of magnetic fields of speakers, also suitable for changing the drive parameters (Qes and with that Qts!). The strength of the respective changes cannot be predicted for certain for the different speakers and has to be established by experiment, depending on the type. In case you want to place a loudspeaker close to a CRT, magnetically shielded drivers are mandatory. Reducing the impact of the magnetic field at a later stage is possible by employing compensation magnet or shielding caps. The following compensation magnets should be attached to the rear of the driver causing the two magnets to draw apart (as long as they don't touch). The shielding cap is simply put over the driver's magnet.